Jean Forsberg, a retired Penn State instructor, works on a painting in her Julian Woods home. Julian Woods is a small woodland community located in central Pennsylvania that has about 20 residents who live on shared land. Deb Fisher, a florist, catches a trapped monarch butterfly in one of the greenhouses near her Julian Woods home. 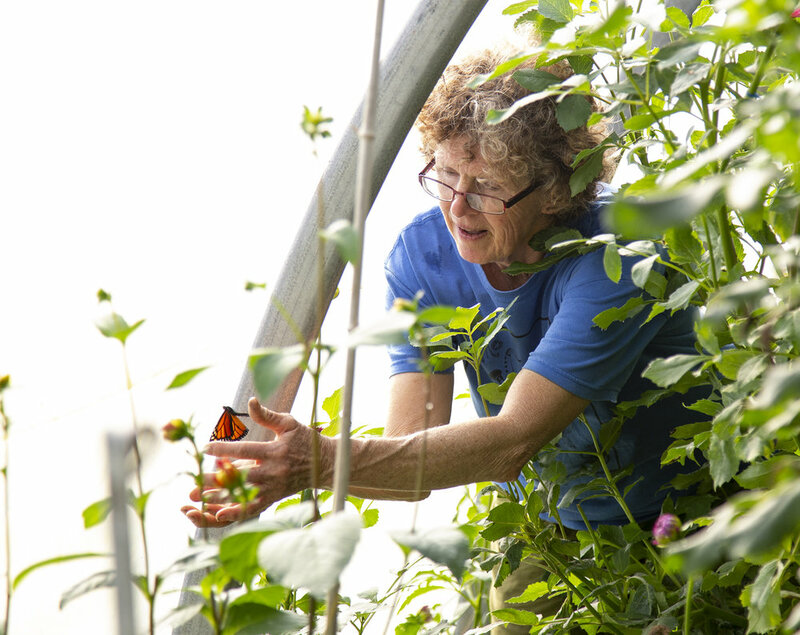 One of Fisher’s neighbors, Jean Forsberg, raises and releases monarch butterflies, and they occasionally fly into Fisher’s greenhouses where she grows her dahlias and the community treats its wastewater. Two community greenhouses are tucked away in Julian Woods. The first greenhouse is used for wastewater treatment, and the second greenhouse is used by Deb Fisher for growing dahlias that she sells at the Downtown State College Farmers Market. 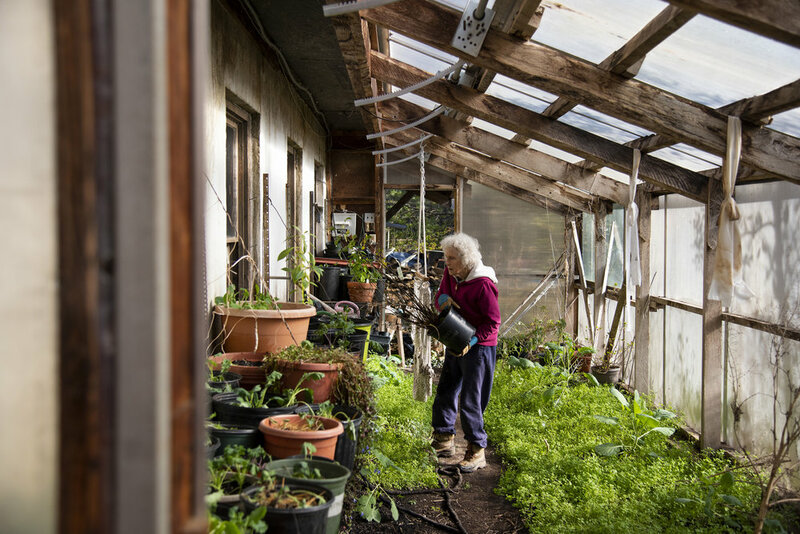 Jean Forsberg moves plants from her outside deck to her personal greenhouse for the winter. Forsberg grows many vegetables, like kale, that she and her husband eat throughout the year. She uses a greenhouse attached to her home opposed to the community greenhouses. Wayne Hansen, a first generation American, works on a sculpture in his Julian Woods home. In the mid to late 1970s, Hansen helped with the construction of Julian Woods by building several homes in the community. Ironically, he says, he now lives in a factory-built home after his original house burnt down. O-An Zendo, a meditation hall ran by Meido Barbra Anderson, is located in the middle of Julian Woods on a road called Endless Circle. Anderson offers regular meditation sessions and occasionally yoga on the weekends, which is instructed by other community members such as Amy Fisher. Meido Barbra Anderson listens as meditation participants offer their thoughts during the tea and discussion section of their meditation class in O-An Zendo. Meditation is held every Sunday and includes a morning service and different forms of meditation such as sitting meditation and walking meditation. Amy Fisher, left, helps participants in her Saturday morning yoga class at O-An Zendo. Amy Fisher, Deb Fisher’s daughter, grew up in Julian Woods with her mom and sister. Down the road from O-An Zendo two boats sit beside a man-made lake that the Julian Woods community uses for recreation. A walking path snakes around the lake, and chairs for relaxing line the water's edge. Mailboxes and a newsstand line the only road into and out of Julian Woods. The community, self-sufficient, maintains the gravel roads on their own. They also maintain other amenities like bridges, which they have built themselves, and the greenhouses.